FAVORITE.TEACHER WORDS.EVAH! Yes, as a teacher you know how valuable our time is as we race to gulp down our lunch while pulling resource books out to frantically look through quality pages to copy. Or is that just me?? Well, I have a solution. I am SO excited to share this resource with you! I created an April Fool's unit a while back and I've been meaning to revise some things. Since I'm in the mountains for a quick weekend getaway this week, I was able to find some time to catch up on my to do list. 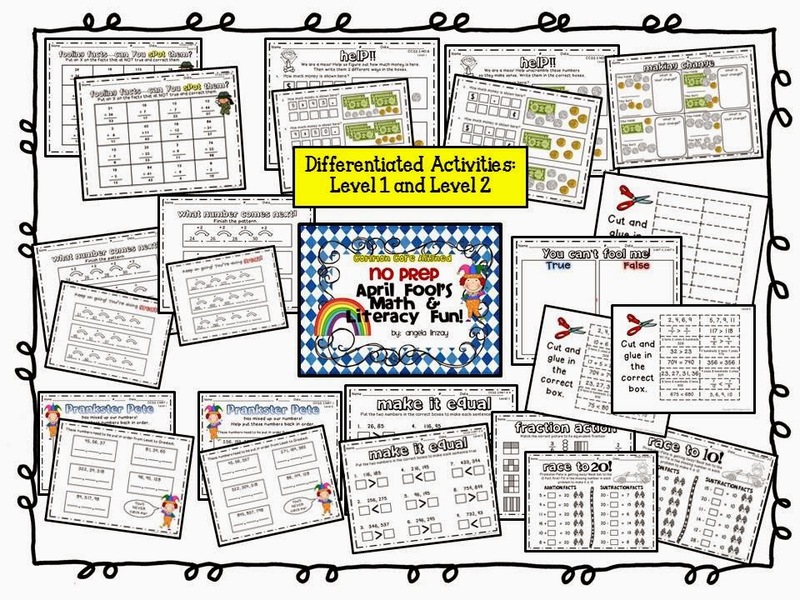 I've added about 10 MORE pages to it and leveled the math worksheets for differentiated work. They are labeled Level 1 and Level 2. This resource can span grades 1-3 with these levels. I am seriously SERIOUSLY excited about this unit because my students always love April Fool's..but really... in all honesty, it's just kind of an obscure "holiday" that no one really pays THAT much attention to. I mean, kids LOVE it but teachers...not so much. Until now!!! Da Da DAHHHHH (applause)!!!! I really think that this packet is just plain FUN! Students will follow Prankster Pete around as he mixes up our numbers and sentences and just makes a mess! If you don't believe me, here are some close ups of this resource. Happy teaching, Friends! Thanks for stopping by!